I can confidently say that liquid/cream highlighter looks good on everyone. Every age, skin type or skin colour a swipe of creamy glow can just finish off the look adding a youthful and beautiful touch. Luckily these types of products are available at all price points and I have found three gorgeous, great quality highlighters to accommodate everybody's budget. First up from the high end budget option is the Nars Illuminator in Copacabana. This highlighter has been part of my collection for years, it is a complete staple and something I just would never dream of parting with. I have pale skin myself and find it difficult to achieve that super glowy look on my cheek bones but this product is a fail-safe for that lovely radiant finish. I often mix it in with my foundation or use it as a base for eyeshadow as the consistency is really strong and doesn't move throughout the day. It retails at £23.00 which I know may be a bit pricey for a cream highlighter, but honestly if you have the budget it is a gorgeous multi-purpose product for everybody. Now this is what I would describe as the middle of the road high street option that is a great price and won't break the bank. Topshop Beauty Glow Highlighter in the colour Gleam is a gorgeous little pot of heaven. I discovered this little gem a few years ago and raved about it to anybody who would listen. This little beauty was also extremely difficult to get your hands on for a while so whenever I saw it I would erratically bulk buy and sometimes give hand outs to my needy glow-less friends. I love using it especially on my brow bone, cupids bow and on the inner corner to give that beautiful highlight across the face. It costs £9.00 and you can buy it in store or I always buy it with ease from Feel Unique. It is one of Topshop Beauty's best products and it remind me so much of Mac in consistency and quality. Finally a gorgeous and amazing value product from the Boots Seventeen range that is not only a beautiful highlight but a primer too. Seventeen Skin Wow Primer is an amazing product for mixing into foundation or applying to the skin before a tinted moisturiser or foundation. This product has a beautiful pearl glow to it that compliments every skin type and is a great product for underneath a powder highlight to give that extra pop of illuminance. It costs £5.99 which is an absolute bargain any beauty junkie should be getting their hands on this product as soon as they can. Thanks so much, yeah I think its great to hear about good quality products from all price points! Thanks so much for reading Serena! I have not tried any of these yet but the topshop one sounds right up my street. I would love to try Nars one but I need to be real as my purse doesn't stretch that far! It is gorgeous and so affordable, honestly it is up there with the Nars highlighter but is half the price. You need to, Topshop Beauty is so underrated and the quality of the products are just beautiful! Ambar you just have to try it, such a great product especially at the price point! Those 3 products look like they work like a charm. 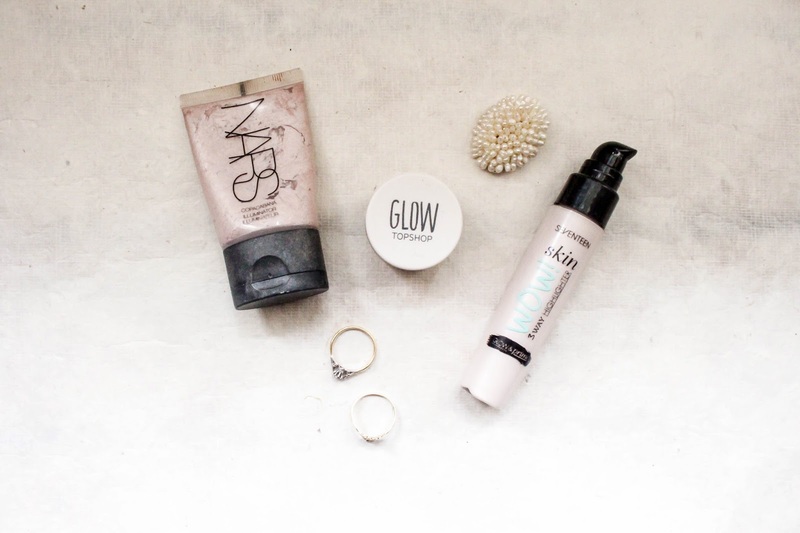 Everyone is obsessing right now with the perfect glow and thank you for sharing! Aw they are all fantastic products in their own way. Definitely worth the hype! I know it is amazing and such a multi-purpose product! i always see that nars one and it looks so nice, i'd love to try topshop's as well! Both are gorgeous products nars if your feeling spendy and then topshop is great price & great product!